Bonjour (or bonsoir, depending on what time of day you’re reading this)! Time again for the French Film Festival, hosted by the Byrd Theatre as it has been for over 20 years. With another roster of top-drawer French films and shorts, Monsieur and Madame Peter & Francoise Kirkpatrick are bringing the best of French-language cinema to Richmond in one of the first (and still best!) French film festivals in the United States. 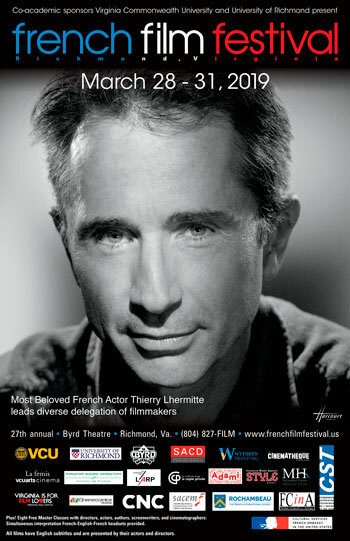 In addition, the festival is dedicated to A-list actor Thierry Lhermitte, the first actor and major filmmaker to grace us with his presence at the 4th festival, which was actually the first festival held entirely at the Byrd. At that point in his career, his major English-language claim to fame was as the star of the film Until September, co-starring Raiders of the Lost Ark’s Karen Allen. He would go on to make more films in English (including Le Divorce) but he has concentrated his career in his native France. In addition to a Master Class celebrating him and his career, he is introducing the Do-Not-Miss film La finale, scheduled to be shown Saturday afternoon at 3 p.m., after which he will moderate a question-and-answer session. Regarding the Thursday afternoon Master Class, there are major changes from past Festivals. All Thursday and Friday Master Classes will be held at the VCU Institute of Contemporary Art and you will need to reserve a spot at eventbrite.com. All feature and documentary films will still be at the Byrd. To kick off the celebration Tuesday evening, Sun Bear Aguilar, son of Festival mainstay George Aguilar, will provide an evening’s entertainment at the Byrd by the Pocahontas Reframed Native American Storytelling Festival, which was founded by them and Brad Brown and is in its 3rd year. A film shown at the most recent festival will be shown Wednesday at 7 p.m. followed by a special musical performance. In total, one would have the ability to view 13 feature films, 2 documentaries and 12 short films over the 4 days, most of whom are introduced by filmmakers who worked on the project; most of those will have the requisite Q&A session following. Passes are still readily available online. See you there!